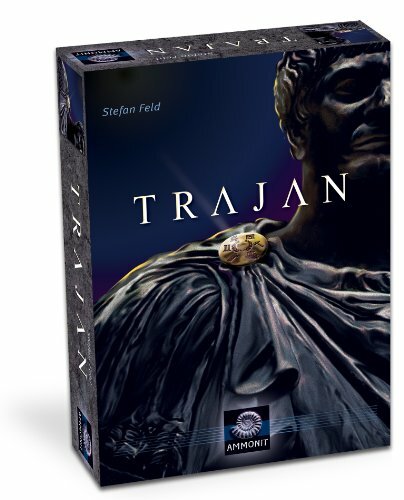 Set in ancient Rome, Trajan is a development game in which players try to increase their influence and power in various areas of Roman life such as political influence, trading, military dominion and other important parts of Roman culture. In Trajan, a player has six possible actions: building, trading, taking tiles from the Forum, using the military, influencing the Senate, and placing Trajan tiles on his tableau. At the start of the game, each player has two differently colored pieces in each of the six sections (bowls) of his tableau. On a turn, the player picks up all the pieces in one bowl and distributes them one-by-one in bowls in a clockwise order. Wherever the final piece is placed, the player takes the action associated with that bowl. Acquire victory points (VPs) in whatever ways are available to you - and since this is a Feld design, you try to avoid being punished, too. At the Forum you try to anticipate the demands of the public. In the Senate you acquire influence which translates into votes on VP-related laws. With the military, you take control of regions in Europe, earning more points for those regions.